When I was in high school, I took AP history from an amazing teacher. Her name was Kristie Pitts. Because of Mrs. Pitts, I passed the AP history test. Not only did she teach me about American history, she served as an example of an amazing woman. Mrs. Pitts was intelligent, engaging, compassionate, and caring. After I took her AP history class, she opened a new class. I am proud to say that I attended the very first Women in History class at my high school. It was an amazing class! We spent hours reading about the accomplishments of women in American history. There were women I had never heard of that accomplished so much. I loved that class, and I still look back at that time with fondness. I wish we had had this book back then! It would have been a great addition to the class. 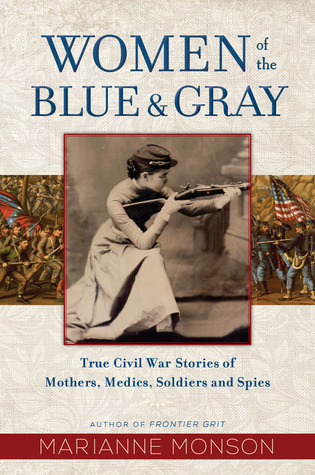 If you’re out there, Mrs. Pitts, this book review of Women of the Blue & Gray by Marianne Monson is dedicated to you! “Hidden amongst the photographs, uniforms, revolvers, and war medals of the Civil War are the remarkable stories of some of the most unlikely heroes—women. North, South, black, white, Native American, immigrant—the women in these micro-drama biographies are wives, mothers, sisters, and friends whose purposes ranged from supporting husbands and sons during wartime to counseling President Lincoln on strategy, from tending to the wounded on the battlefield to spiriting away slaves through the Underground Railroad, from donning a uniform and fighting unrecognized alongside the men to working as spies for either side. I have always loved learning about history, especially American history. The Revolutionary War is my favorite, but I also enjoy learning about the Civil War. I haven’t ever read a history book devoted solely to the contributions of the women of that era. When I heard about this book from the publicist, I immediately jumped in. Yes, of course I’ll review it! I’m so glad I did. It is such a good book! I read it almost all in one day because I couldn’t put it down. I found it fascinating to learn about each of the women portrayed in the book. Although some women helped in conspicuous ways, others served in the background, never gaining recognition for her service. Some women worked as nurses and tended to the wounded, and others sacrificed their homes to the armies. I found it fascinating that women disguised themselves as men and fought on the front lines. This book is very well written. The stories are engaging, and the women come to life on the page. There are some well-known women like Harriet Tubman and Clara Barton, and then there are lesser-known women like Anna Ella Carroll or Cornelia Peake McDonald. I love that women of all backgrounds, colors, and sides are discussed. It doesn’t matter whether the woman is from the North or the South, is black or white, or is Native or an immigrant, each played an important role. I learned so much from this book! It was fun, and yet sobering, to look into the lives of each of these women. The amount of research Ms. Monson must have done is staggering. This book is well thought-out, well researched, and well written. Women of all kinds are highlighted, and there’s no judgment regarding her viewpoints. …people on every side often need, more than anything else, an opportunity to be heard. They need to be heard even if they don’t look like us, think like us, and especially if they disagree with us. They particularly need to be heard if the dominant discourse tends to ignore their voices. Sometimes, I think one of the most important acts of kindness we can do for one another is to listen—really listen—to each other’s stories.